Gina De Gorna comes from a family of Artists and Craftsmen. She has lived and studied extensively Fine Art both in Europe and in the US. 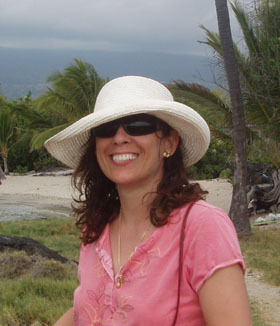 In 2002 Gina found paradise and eventually moved to Hawaii Big Island. Gina De Gorna received her first Art award at the age of ten and later on she has been a teacher for 11 years. Having painted and studied for more than 25 years, Gina De Gorna finished more than 500 Art pieces. She continuously does research, reads and writes about art, tutors, experiments with color, art techniques, styles and painting subjects. In the USA Gina De Gorna launched her career as a full-time artist and as such she can offer originals of oil and acrylic paintings and variety of limited edition Giclee reproductions, cards and prints. Gina’s fine art works and portraits have been shown in Art Galleries both in solo and group exhibitions in Europe, Canada, and the USA. Her work incorporates a wide variety of subject matter, including cartoons, illustrations, portraits , landscape and seascape images, together with paintings of animals, birds, sunsets, and flowers. Her paintings are recognized for their realistic and expressional values. They are the product of a continuing process of exploration through which the artist is seeking to portray personal or visionary interpretations of the world. Gina’s paintings are impressions of places and events from everyday life and personal responses to what she sees or feels. They have been collected in five continents. How do I do it and how long does it take? 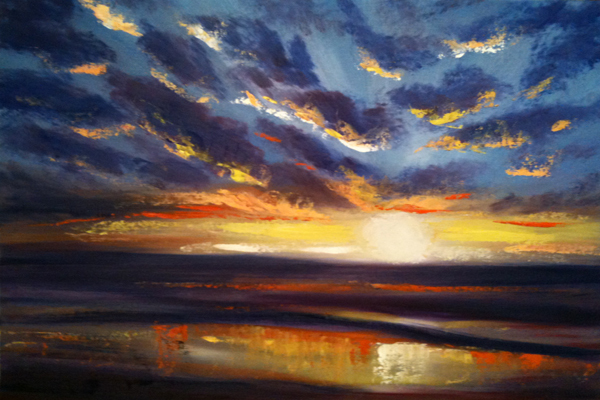 How to Paint a Colorful Sunset Oil Painting? Stretched Primed Canvas or Canvas on Board suitable for Oil Paintings. FLAT Bristle Oil Painting Brushes: 2” and smaller. Metal Palette Knife medium size. Oil Paint Colors: Titanium White; Cobalt Blue; Ultramarine Blue; Light Yellow; Orange; Alizarin Crimson. Medium dark flat purple acrylic paint. The softest 2″ flat brush you can find in a craft store. There’s no need to dilute or pre-mix the oil paints. Remember: over mixing oil paint results in a muddy and grayish look of a painting. Oil paints are special – each color is made of specific pigment and each color mixes in a unique way with the other colors. You need to mix the right oil paints in order to get the shade/color you need in your painting. If you do not use the recommended Oil Colors, I suggest you make some color samples first by mixing a very small amount of different paints on a piece of canvas, palette or even paper just to get to know your oil paints. Use the recommended brush strokes for each STEP. For the brush strokes: practice, experiment, practice, experiment..even on a piece of paper first until you feel the brush and are happy with the results. Do not overdo things. Overworking is never good for a painting. Establishing background Under Color, Horizon Line and Light Source are extremely important for the overall look of the painting. Apply Medium dark flat purple acrylic paint to the entire canvas surface with the 2″ brush and let the canvas and the brush dry completely! When the surface is dry, establish the HORIZON LINE and the light source – the SUN. 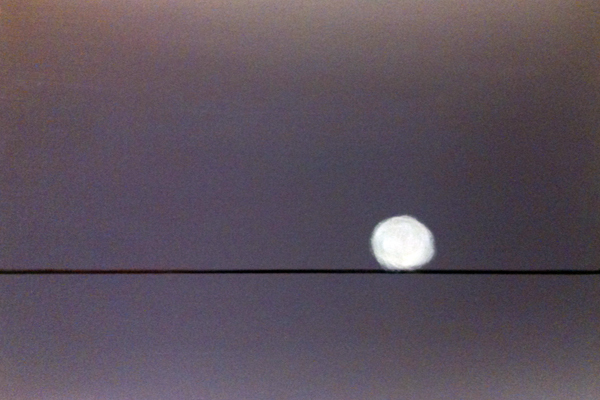 Use a small brush with dark color for the Horizon line of the painting and use pure white paint for the sun. Tips: Use X brush strokes to smooth the under color. Do not under estimate the precise placement of the Horizon and the Sun. This will save you time and struggle later. If you have to, use measuring tape and a long straight wood piece like a ruler for the Horizon. 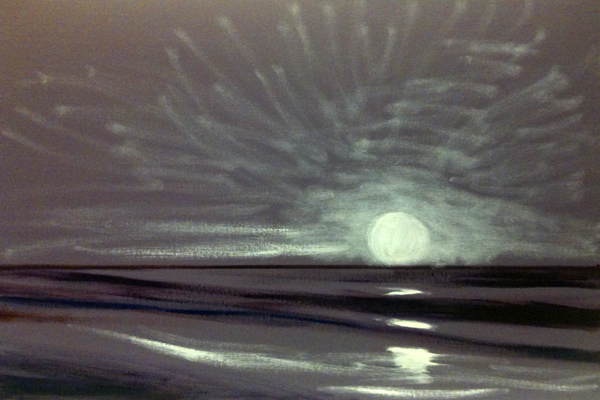 Establishing basic sketch/idea of darks and lights is very important for the BALANCE of the painting. Apply the darkest and the lightest spots/ lines by using smaller flat brush or a palette knife. Tips: Use loose strokes and do not dilute the paint. 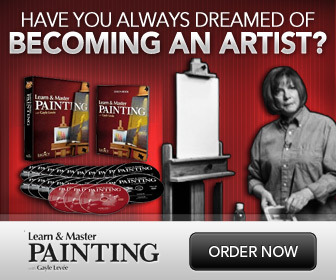 Apply all COLORS for the Background of the whole painting with a brush or a palette knife. The strokes must follow the lines of the composition. Use only Cobalt Blue Paint for the sky and white; orange and yellow around the sun. Tips: Use unmixed colors and do not dilute the paint. 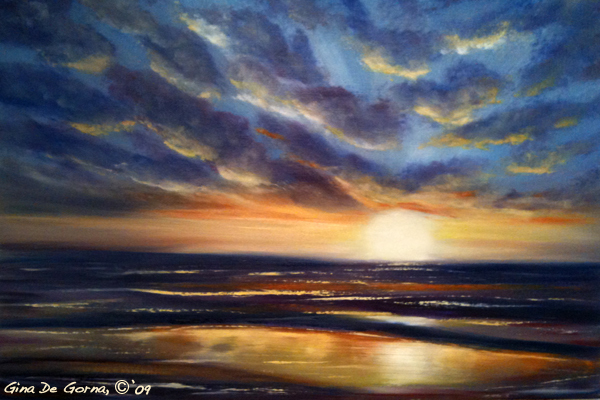 The purpose of this step is to blend the colors/ the oil paint of the Backgrounds both for the sky and for the sea. The sky needs a smooth background for the clouds to float and the Sea needs a blended background colors for the ripples and the highlights. The background should be nice and light. Use the palette knife to take any excess/ thick paint from the surface of the painting. Do not overwork the blending. At this point, clean often the brushes with paper towels; NOT in turpentine! Use big clean brush with very light strokes for the final blending of the painting. 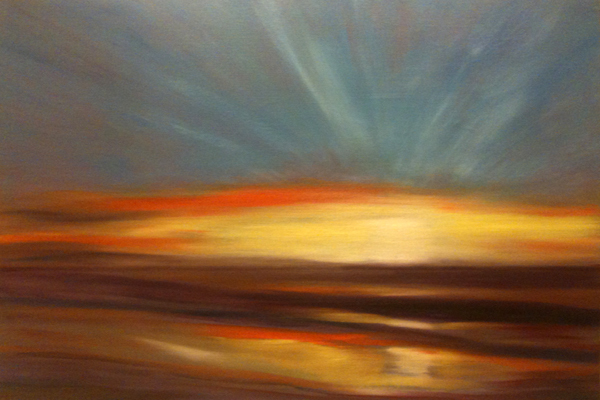 Applying fresh oil paint for clouds and foreground. Here you must think cloud shapes, ripples, reflections and highlights. Use Ultramarine Blue and Alizarin Crimson to shape the clouds. Now you may pre-mix yellow, orange and white to get the peach color. Use the edge of a Palette Knife to put light color paint for highlights and white at the sun and the lightest highlights. Use darker colors at the corners of the painting. This helps to focus easily at the focal point – THE SUN and its rays and reflections. Do not over highlight! Choose carefully where to put the lightest highlights. Blending the oil paint and shaping puffy clouds by pushing the corner of a big bristle brush. If you put too much paint, or if you overworked some part, scrape it out with the palette knife and reapply fresh paint. Do not overwork the clouds. Otherwise they’ll look muddy and heavy. Do not overkill the highlights. If you do so, reapply fresh paint. Use very light circle motions to blend with the softest brush possible. Wipe/clean the brush often with a paper towel. Do not clean the brush in turpentine – you need a DRY brush for the clouds. Absolutely no hard edges in the sky. The sky and clouds must be soften well in order to look in the distance. Do not use cotton for the clouds of an oil painting. Cotton sticks to the paint and then you can’t remove it. 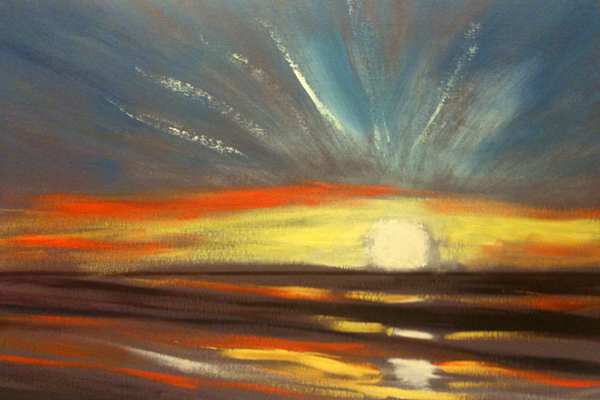 Use bigger brush with less paint and just push with light strokes, then clean the brush and soften the clouds. 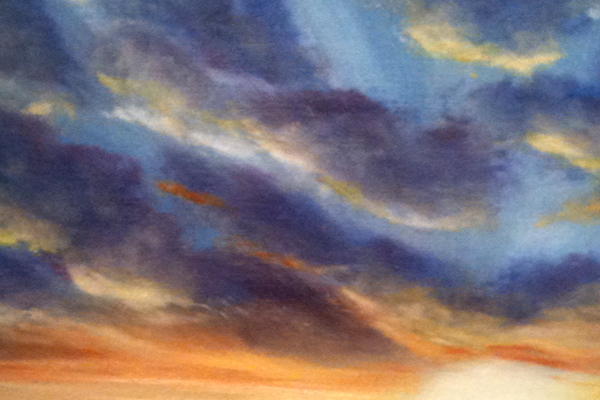 Establishing FOREGROUND details of the Sunset Oil Painting is important for the Perspective. The light soft clouds at the back NEED sharp contrasting edges and sparkles for the foreground. Do not over blend the foreground of the painting. 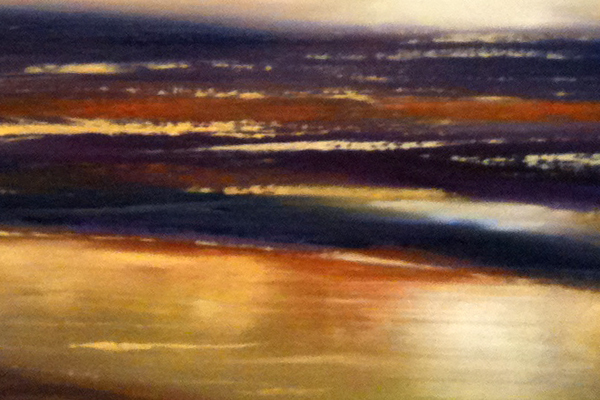 Use the long edge of the palette knife for the ripples and highlights. After the oil paint of the painting has dried, readjusting of overall Balance and light touches may be done to fix some details by applying and blending more paint. Sign your oil painting with a long thin round brush with some very diluted paint or just use a permanent marker. Retouch Varnish may be applied for protection of the Oil Painting. This Retouch Varnish allows the oil painting to further dry and at the same time it provides some luster and protection for the oil paint. Practice your signature first before applying it with paint. PLEASE NOTE: Oil paints need 6 months to dry in full. Only after 6 months, some OIL PAINTING FINISH VARNISH may be applied for further protection of the Oil Paintings. You may purchase both Retouch Varnish and OIL PAINTING FINISH VARNISH at any Craft Store. Looks Amazing!! Learnt a new thing today.. Totally Loved it..worth full tutorial for beginners. Thanks for the share.